His skills and accomplishments were numerous. Among other things, he was a navigator, cartographer, draftsman, soldier, and explorer. He was instrumental in the founding of Quebec City. And he was later dubbed "The Father of New France". So who is this rather remarkable fellow? We are, of course, talking about none other than Samuel de Champlain. 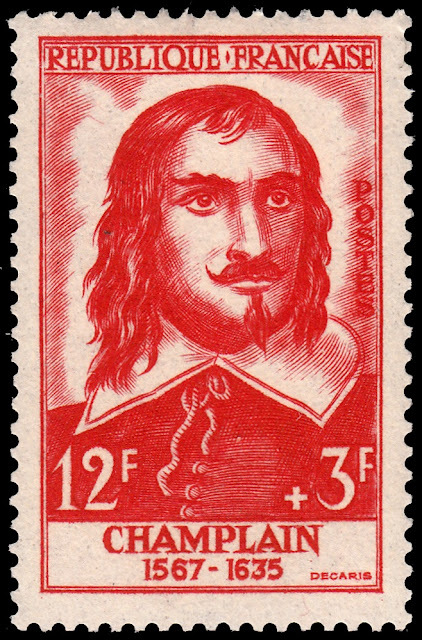 Samuel de Champlain was born in Brouage, France. There is some contention as to the actual date of his birth. Some say as early as 1567. Other theories include dates up to and including 1575. Scholarship is now fairly certain he was born on or before 13 August 1574. Whatever the year of his birth was, we do know that he began his life as an explorer and seaman in 1598 when he travelled on the ship Saint-Julien with his uncle-in-law. The ship had been commissioned to carry Spanish troops to Cádiz. During the journey, which was apparently long and hard (over two years) Champlain was given the opportunity to "watch after the ship". This was an excellent opportunity for him to learn the art of seamanship - to "learn the ropes" as it were. And Champlain also took the opportunity to hone his burgeoning writing and cartography skills. He wrote detailed notes of his journey, including illustrations. So good was the work that upon return to France, King Henry IV rewarded Champlain with an annual pension. Then when his uncle died in 1601, he left Champlain his considerable estate along with a merchant ship. His future as an explorer was set. In 1603 he made his first voyage to North America as an observer on a fur trading expedition. Making the trek across the Atlantic and exploring parts of North America became second nature to Champlain. Indeed, in 1604 and again in 1605 he was back over there, exploring the eastern coastline as far south as Cape Cod. But it was in 1608 that Champlain would forever cement himself in the annals of history. Sent back across the Atlantic at the command of a fleet of three ships to find a suitable spot for a colony on the St Lawrence River, he came across a nice spot which he would name "Quebec", which comes from the Algonquin word kébec meaning "where the river narrows". This was the origin of Quebec City. The first settlement consisted of three buildings, a stockade, and a moat, which Champlain called the "Habitation". The Habitation became Champlain's lifelong passion. He even built himself a large dwelling he called Fort Saint Louis. Throughout his life, Champlain also settled the area that became the city of Montreal, and he made detailed maps of the Atlantic coast and the Great Lakes. By 1620 he had settled into an administrative role as the de facto governor of New France from a command post in Quebec. Samuel de Champlain died on December 25, 1635, in Quebec. On 11 June 1956 France issued a set of six stamps honouring famous French people. One of the stamps features Samuel de Champlain. The stamp was designed and engraved by Albert Decaris. The stamp is a semi-postal with a face value of 12f with a 3f surcharge for the benefit of the Red Cross. When I first saw this stamp I wasn't really all that enamoured by it. But over time I have come to like it. The strong bold lines and the penetrating eyes of the explorer, the eyes of a visionary. And of course I love the beard!